Steven wrote most of the code of this game when in he was in Year 11. He returned to it recently to make it presentable and to indicate possibilities for future development. Even though it is not in its final form, we think it is a valuable resource for its technical features and for giving you ideas to implement in your own games. Steven has written a useful instruction document, but admits that there may be "undocumented features" at this stage. The following screenshots provide a flavour of the game. Immediately after you are killed the menu reappears. 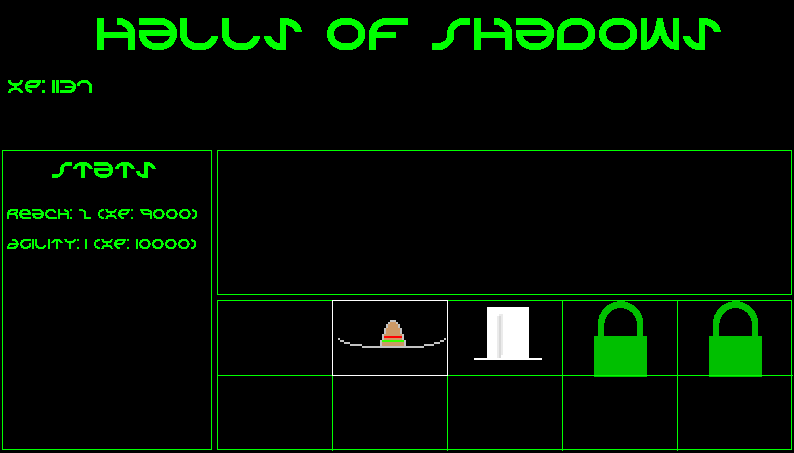 You can check your accumulated score in the Halls of Shadows. We look forward to your feedback on the game. See the following page for the instructions and subsequent pages to see the source code. console command system (now commented out) to test various aspects of gameplay and mechanics. We include one of Steven's sound files. You can put your own music files into an array and use Steven's (now commented-out) code to select one at random for each game. Download the zip file (4.48MB) containing the source code, the executable, the libraries and "readme" files, the instructions, the images and one sound file. Unzip all of the contents to a convenient folder and double click on blink.exe.